This was my first book by Adrian Tchaikovsky and it was even better than expected. 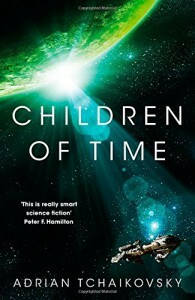 A completely entertaining story of a far future exploration and terraformimg of a new world. This is hard science fiction at it's best and in the tale of the spiders rise to an advanced species, I was reminded of one of my old favorites, Dragon's Egg by Robert Forward in the struggles they go through as they move forward. If you enjoy a hard science fiction tale with overtones of space opera, you definitely want to pick this one up. 5 Stars for a stellar tale.